You are here: Home / CIS Football / Eye on the CIS with Jim Mullin: BC shot at Greene unfortunate. Eye on the CIS with Jim Mullin: BC shot at Greene unfortunate. 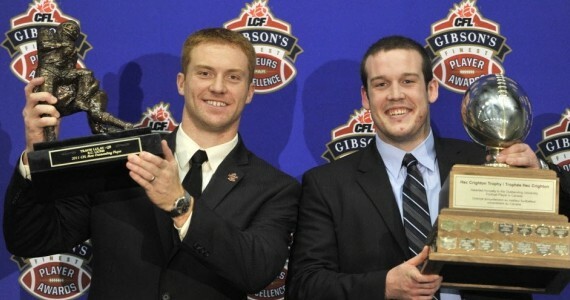 CFL MOP Travis Lulay and CIS Hec Creighton winner Billy Greene of UBC. That was the joking and sarcastic response by someone in the BC Lions office when I suggested that UBC’s Billy Greene, the 2011 Hec Crighton winner may be a good addition for their squad late in the draft. Until the CFL and the CFLPA decide Canadian quarterback development is an issue worth addressing in a substantive way, Canadians will be a camp option on the free agent market. At least for now, they are non-counters against the training camp rosters which can get guys like Vanier Cup MVP Kyle Quinlan and AUS Champion Kyle Graves of Acadia onto the roster of the Montreal Alouettes as camp arms. The good news is now you can add CJFL player of the year Jordan Yantz of the Vancouver Island Raiders of the BCFC to that list. The Lions added him to the training camp roster on Monday. The 22 year-old native of Regina, Yantz shows some fine mechanics especially on the run and can place a ball well. It can be said that the defenses in the BCFC may not be at the level of the Calgary Dinos led by Rider draft Sam Hurl, or last year’s edition of the Regina Rams with third-round New Orleans pick Aikem Hicks at defensive end. Still, if the foundations of mobility along with a powerful and accurate arm are present, then Yantz will benefit from the camp along with the rest of the BCFC with his one remaining year. The connection between GM Wally Buono and junior football is strong. The former St. Leonard OFC player has the CJFL most outstanding player award named after him. Plus, he’s had his share of success with junior players with running back Andrew Harris being the most notable. According to The Province’s Lowell Ullrich the Lions new head coach Mike Benevides, the junior MVP is more deserving of a look than the Hec Crighton winner. But the Lions also suggested Yantz has a better upside than UBC quarterback Billy Greene, who did not attract any interest during this month’s CFL draft by teams who see him as a running back. “The best [quarterbacking prospect] in this province is the one who threw on the weekend,” said Benevides. Fine. Greene didn’t attend the Lions free agent camp before the draft so there were some noses out of joint. The football community in BC is fractured enough without the pro team in this province throwing UBC’s on field leader – and in turn the whole program and the CIS – under the bus. In a province where three down community ball battles with American high school, where CIS UBC is divided from NCAA D2 SFU, and where the BCFC no longer wants to be a feeder system for either of them, you have a very complicated playing field. Add Football BC’s unpaid bills to Football Canada leaving them ‘not in good standing’ and you have a maverick leading the herd. While the Lions aren’t responsible for the amateur game they need to provide a modicum of leadership for it. Taking a shot at the top player in the nation in playing on a rebuilding program in your home town does not achieve that objective. Perhaps you can mark it up to inexperience on Benevides part. As the new boss he’s going to be quoted from every angle which wasn’t the case five months ago. Anyone who actually watched Greene’s heroics in the Canada West in a game-in, game-out basis can tell you that he has that special intangible. It’s the Matt Dunigan-like quality to rally a team to win when they really have no business to be in a game in the first place. Those are the qualities which make a quality quarterback. Some of that isn’t measurable in an e-camp. It will be interesting to see what kind of Billy Greene we see coming out of the gate in 2012. Between this and the 0-8* mess created by a lazy rubber-stamp player eligibility procedure, one has to think he’ll come back with a chip on his shoulder.